Canada is becoming a global pioneer when it comes to cannabis legalization. On October 17, weed will become legal across the entire country and recreational sales will officially begin. In many ways, Canada’s legalization will be an important testing ground for other places considering changing weed laws. So how do Canadians feel about it? Are they worried about legal weed? Newly published stats shed some light on these questions and more. In particular, a new poll shows Canadians are more concerned about Donald Trump than legal weed. Are Canadians Worried About Legal Weed? Earlier this month, Abacus Data surveyed 1,500 Canadians aged 18 and up. The survey asked them about a range of issues in an effort to gauge the most pressing concerns for adults in Canada. After analyzing survey results, the company published its final report. According to Abacus Data, this information could be helpful as Canada prepares for the 2019 election year. Interestingly, the survey showed that Canadian adults really are not that worried about the legalization of marijuana. In fact, out of nine specific issues, legalization was the least pressing concern for adults who took the survey. 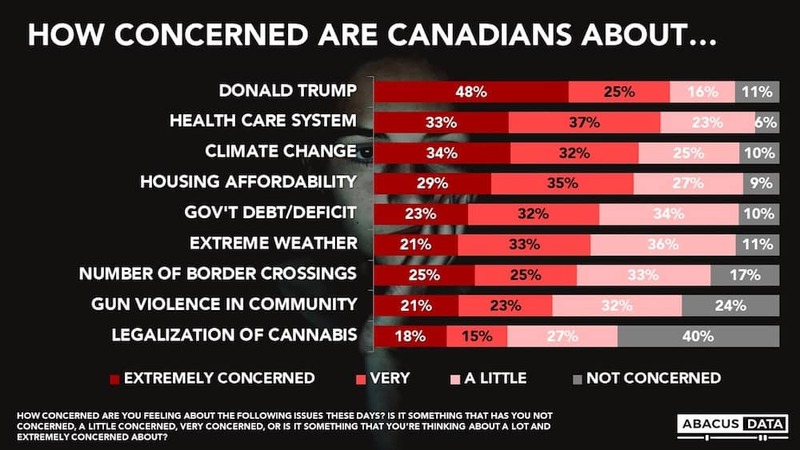 At the same time, Donald Trump was the number one largest issue Canadians reported being “extremely concerned” about. After Trump, Canadian adults reported being concerned with issues related to health care, climate change, and housing affordability. Legalization was at the bottom of the list of concerns. There were some interesting variations in the data when analyzed according to demographic variables. For example, people over 45 years old ranked health care as their second most pressing concern. Meanwhile, health care was the fourth largest concern among people under the age of 45. Similarly, liberal voters were most concerned about Donald Trump, climate change, health care, and affordable housing, in that order. The top four concerns among conservative voters were different: border crossings, government debt, health care, and affordable housing. But almost universally, no matter how you break down the data, cannabis legalization was the least pressing concern. The only group for whom legalization wasn’t the least pressing concern was conservative voters. Among this cohort, weed was the sixth largest concern. For all other groups, legalization came in dead last. This included young voters and older voters, folks who live in cities and those in rural locations. At the same time, Donald Trump was the number one biggest concern for all groups except for those identifying as conservative voters. These findings are more or less in line with other stats, many of which show consistent support for legalization. For example, a survey conducted in 2017 by researchers at Dalhousie University found that 68 percent of adults favor legalization. A more recent report, published in March 2018, found slightly lower rates of support, although it still showed more adults in favor of weed than opposed. This study found that 42 percent of Canadians support legalization, while 38 percent of adults said they did not support legalization. In any case, there has long been popular support for marijuana legalization in Canada. The country is now set to fully legalize cannabis later this fall. The post Poll Shows Canadians Are More Concerned About Donald Trump Than Legal Weed appeared first on High Times.